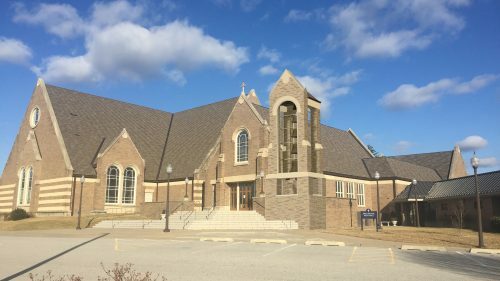 JMT Architecture recently completed the design develop drawings and is currently working on the construction drawings for a new bell tower at St. Louis Roman Catholic Church in Clarksville, Maryland. At 53-ft high and containing five bells, the new tower will sit at the main entry of the church and welcome guests and parishioners. Construction is expected to begin in the spring of 2019 and be completed by August 2019. The bell tower is the capstone project for St. Louis’s Campus Master Plan and fundraising campaign. The architectural design includes a matching façade to ensure the tower will integrate seamlessly with the church. The design work also includes improvements to the two-level entry plaza, with the tower sitting at the top level. St. Louis’s campus includes the St. Louis School, the Pastoral Center, and the John Evans Gym and Parish Activity Center. The historic 1889 Chapel is also on campus, with the original 1855 Chapel located 3 miles away. St. Louis serves more than 4,200 families, and the St. Louis School educating approximately 525 students ages Pre-K through 8th grade. St. Louis is one of the largest congregations in the Archdiocese of Baltimore. JMT Architecture and Kemp have had the privilege of working on other Parish projects, including expansion of the Gym and Parish Activity Center and historic architectural work to restore the original Chapel.